Transformer Fibercrete box pads | Built by Concast, Inc. in Zumbrota, Minnesota. 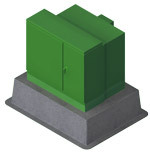 Concast's transformer Fibercrete® box pads are high strength and provide excellent durability. The smaller, single-phase box pads can be lifted by two people. Three phase transformer box pads have internal reinforcing walls to fully bear the heavy oil tanks. Openings can be customized, & non-standard boxes are available.